It's time for the New Product Launch! All the Stamps, Die-namics, and Stencils can be found HERE. 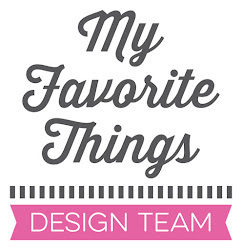 Please remember to visit each of the MFT Designers' August New Product Launch posts on the MFT Blog and leave a comment by the end of the day on Thursday, August 9 for your chance to WIN one of two, $100 Gift Vouchers. Ready? Set. Comment! I have a really fun project to share with you today, it features the fabulous Rolled Rose Die-namics. 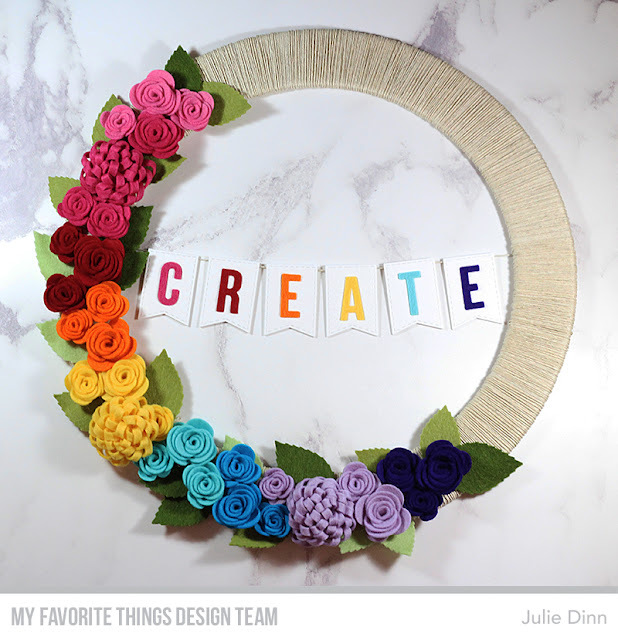 I created this rainbow floral wreath for my stamp room. I wrapped a chipboard wreath with Hemp Cord. Believe it or not, I actually wrapped it twice, the first time I kept the cord really tight. I then went over it again a second time, but I didn't keep the cords so close together. 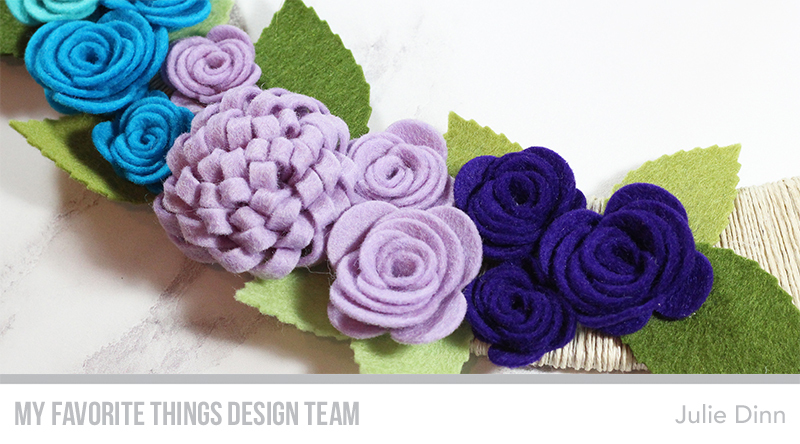 I picked out eight fabulous colors of MFT felt to die-cut for the flowers and leaves. I used the Rolled Rose Die-namics, Mini Rolled Rose Die-namics, and Loopy Bloom Die-namics. The leaves were die-cut with the Layered Leaves Die-namics. I placed a set of three or four flowers in the same color together on the wreath. Once I had them in an arrangement I liked, I slipped the leaves underneath and then glued the leaves and flowers down with a hot glue gun. To create the banner I used the Stitched Jumbo Fishtail Banner and Stitched Alphabet. I am so happy with how this turned out, I will enjoy seeing all the gorgeous colors hanging in my stamp room. Great idea! love your wreath. Your wreath is awesome!! I like everything about it!! What a great idea. O-M-G!!! This wreath is fabulous!!! All those gorgeous flowers made in virtually every color is just, WOW! Absolutely love it! Wow this is a substantial art work, beautiful! Love all those felt flowers! Scrumptious colors! What a awesome creation! It will display pretty in your room! thanks for the inspiration. How creative is that??!! Your craft room will feel like Spring/Summer all year, I love it. Your wreath is beautiful! What a great addition to your craft room! That is amazing! So creative...I love all the bright flowers and how clever to wrap the chipboard with twine. Your wreath is so pretty! Do you mind sharing the diameter of the wreath and the width of the ring? This is great inspiration for a Christmas present! Wrapping that ring with twine twice? Unbelievable result. You have put so much work into this with fantastic results. 'Im on my knees bowing up and down! unbelievably gorgeous...the colors are simply ah-mazing !! This is just beautiful, perfect for your craft room! Wow!!! 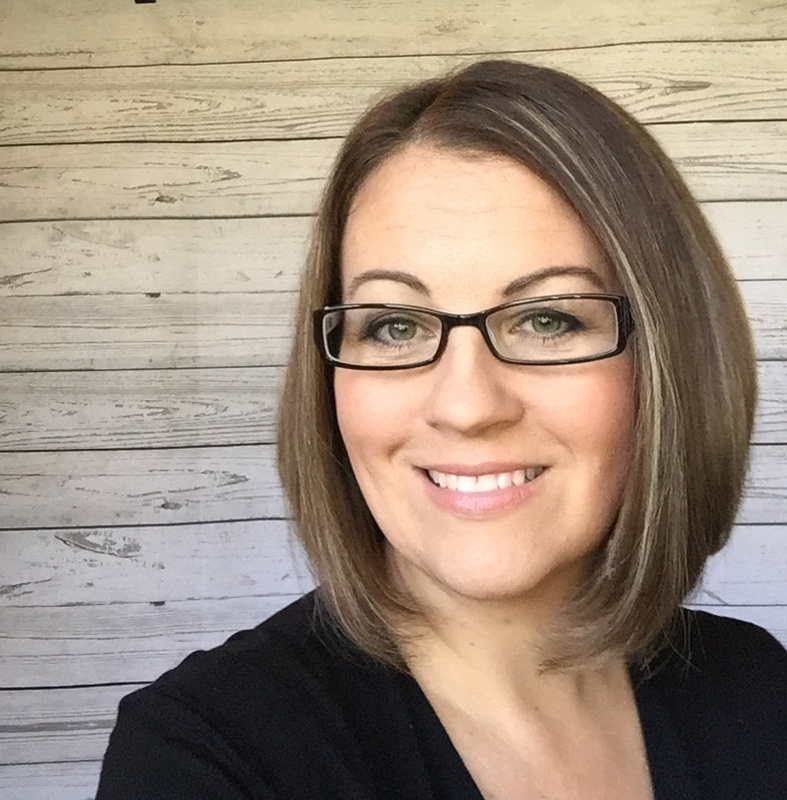 Awesome project!!! It's so cool!!! Such a happy wall hanging for your craft room! Super idea! 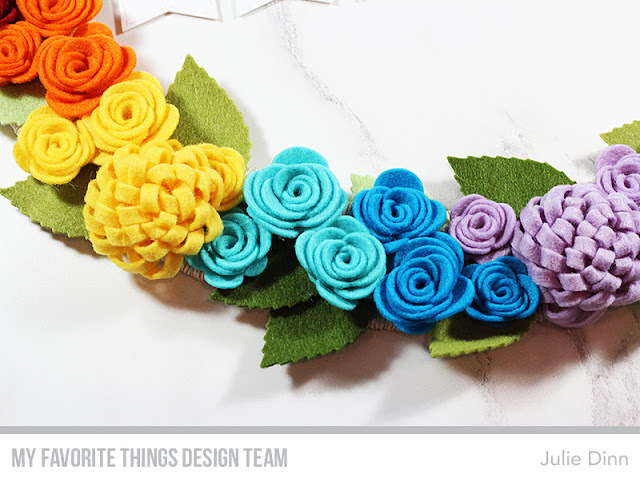 The rolled felt flowers look fabulous! Wow! That's gorgeous!! Colorful and fabulous work!! This is beautiful! I need to add some felt to my next order an give it a try in my Big Shot! Love the rainbow wreath!!! Great job with those felt flowers, sure is gorgeous! Wow what a detailed and pretty wreath! Lately, I'm so used to seeing cards... what a beautiful change of scenery! Looks like you had fun getting crafty! What a great wreath! I love the rainbow colors. It's always great to know that dies can be used for more than just paper! So very pretty! Nice to think beyond cards & scrapbooks. Oh wow, what a gorgeous wreath! Love the texture from the felt and the jute twine. Lovely vibrant colors. Love this--so pretty and colorful. What a gorgeous wreath !! Awesome creation !! What a beautiful decor piece! Love these fab colours and thanks for sharing. WOW!!! That is absolutely gorgeous!!! Whoa, that is so pretty!! I absolutely love it! 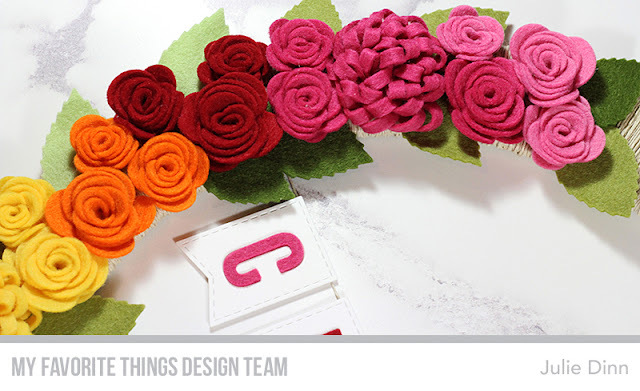 Thanks for showing how well those dies work for felt flowers and leaves! Great alternative use for all the bloom dies! So much fun!